Popnfresh Good value "God helmet for the price." 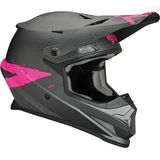 Lrobins7 Great helmet for the money "I bought this helmet about two months ago and i have no complaints about it at all. Especially for the money. It fits comfortably and is lightweight as well."